Population Zero Building Trailer Shows How to Craft a Home of Your Own | Nerd Much? When Population Zero was formally announced just a month ago, the team at Enplex Games had lofty ambitions. 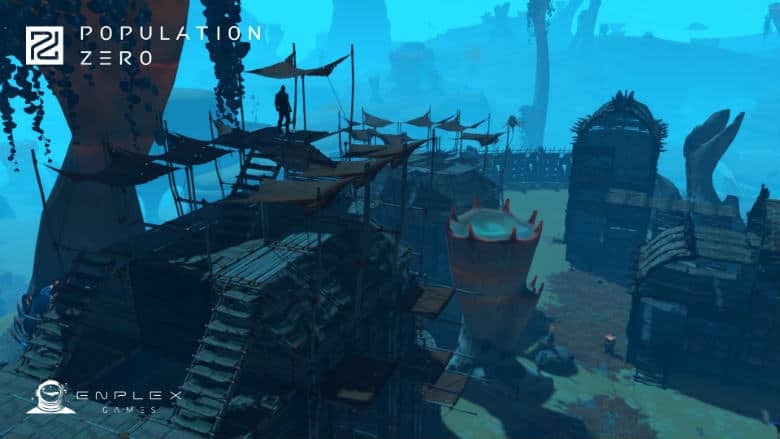 Upon their title’s unveiling, they stated that they had plans to “reimagine the foundations of the survival MMO genre.” And with today’s Population Zero building trailer, you can see how a core component of the game is looking to do just that. The Population Zero building trailer showcases a building mechanic that looks quite similar to how Fortnite’s functions. Players will traverse the world and use tools to harvest materials from planetary objects such as plant life and stone. From there, you’ll begin to build the foundations of your encampment – modestly at first. But as you continue to build upon that foundation, you’ll see the depths of the game’s building mechanics as you continue to construct your fort to your liking. The development team that what you’re seeing in the Population Zero building trailer is different than what was experienced in pre-alpha. The team adjusted building balance in an effort to make resource gathering less tedious. Enplex Games also teases that certain resources can only be gathered with certain tools or at a certain time of day. Some are only available at night, which makes gathering them perilous due to planet’s most fierce predators being out and about. If you’re interested in giving Population Zero a whirl, you can head to their website here to get information on joining the game via one of their various Founder’s Packs.